Bedding Information: 2 Queens in Master B.R. 2 Full Size Beds in the 2nd B.R. 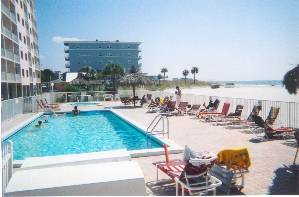 the Gulf Coast this large deluxe 1620 sq. pool and wonderful invigorating jacuzzi. balconies, windows and an updated pool. New deluxe microwave over new electric stove, ,dishwasher, and many other appliances in condo. Two balconies, One from the livingroom overlooks the Gulf Waters and other from master bedroom overlooks the Intercostal. Two newly remodeled bathrooms. Three 25" tv's. One in each bedroom and other in livingroom. DVD player with each TV. All the floors are tiled including the Bedrooms. Other eminities include iron and ironing board, sweeper, beach products, bathroom scale and more. 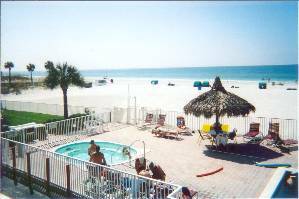 Nearby there are casino boats, jet ski rental, fishing, boating, shopping, resturants, golfing, 2 hours to Orlando and Disney attractions and much more. Owner John Synodinos' favorite view! Pool and Hot tub right on the beach. No busy highways to cross! Seperate dining area, perfect for eating in. A friendly environment, welcoming many people from all across the world. Watch the surf as you swim in a heated pool or lounge poolside to soak up the rays. 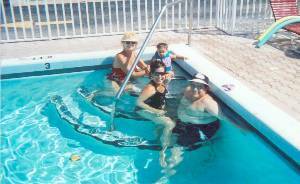 Relax in the hot tub after a walk on the white sandy beach. 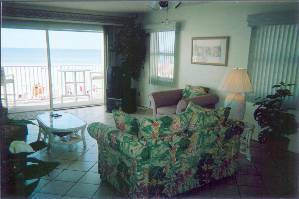 Enjoy the view of the beach from the family room or balcony any time of the day or night. Spent a wonderful week in this condo. Everything was perfect. Check-in was flawless and there were no problems with the condo. The location is wonderful. The first floor is great because you really have no need to use the elevator. Communication with the owner is very easy. I hope we can spend many years staying in this condo for our vacation. Amazing condo! We really enjoyed it there. 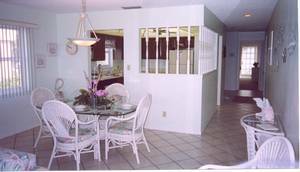 It is a very neat condo with a wonderful atmosphere and a great location. 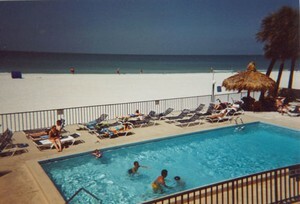 I would love to go back to the condo again! This condo was fantastic! It was much roomier than any of the condos we have stayed at in the past. The beds were great (no sore backs). It was well-stocked with utensils, etc. 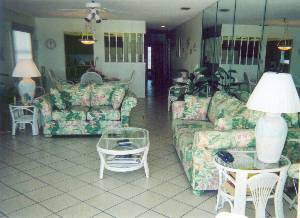 It is a very clean, well-decorated condo on a great beach! It is well worth the money! down the beach. 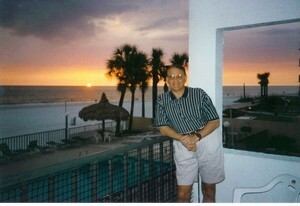 The area is one of the best in Florida, the sun sets are incredible. I have stayed all over Florida and this is my favorite place. the last yeay. If you stay here you wont be disappointed. Great Condo! This place is convenient to everything! Close to the pool and right on the beach. It is well kept, updated and for the price you feel like your getting more than you paid. Plus the ocean sunset is incredible! I highly recommend this condo to all my friends and family! Rates do not include cleaning fees of $75 or tax (12%) All rates subject to change without prior notice. 20% discount on 4+ consecutive Sat. to Sat.weeks. Additional days prorated as available.10% for Feb. and Mar. special; booking within 30 days inquiry is 10% discount. Deposit: 50% prior to confirmation of rental. Balance minimum two weeks before occupancy. Cancellations and Refunds: Full refund with 120 day notice, minus $300 administrative fee.